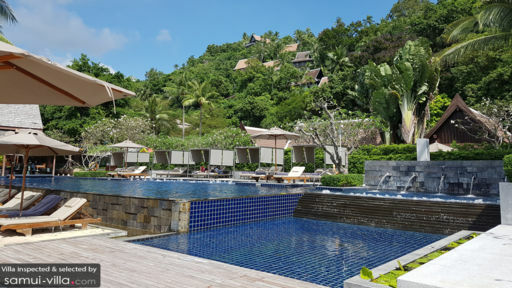 In Baan Talin Ngam Samui, Sonthaya Sea Villa is a private property minutes away from the beach providing sprawling views across the bay for a splendid experience. 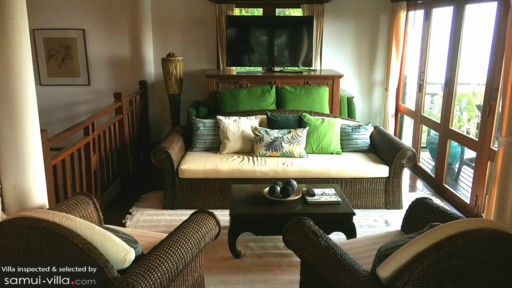 You are free to book the four-bedroom villa as is or along with a private apartment that has one bedroom and sofa beds in the living area. If you’re travelling with a larger party, then a five-bedroom private home would be the best option. With an option to choose from one-bedroom apartment and living room furnished with daybeds, four-bedroom villa, or five-bedroom property with villa and apartment, you can do as you wish based on preference. Each bedroom is furnished with large double beds, single beds or sofa beds, providing utmost comfort to guests. The bedrooms have en-suite bathrooms that are fitted with showers and necessary facilities. A sunset terrace wraps around the entire villa offering the most spectacular views of the bay area with the ocean and the hotel resort as well. During the evening, you can rest up on the rattan sofas and chairs where you can enjoy a cup of tea as you relish the spectacular vista. 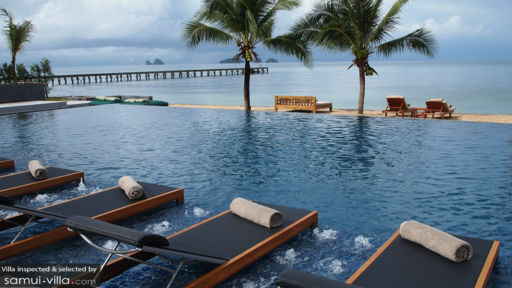 The resort offers the use of its infinity swimming pool to guests as well as the beachside swimming pool. There are five other pools that attaches to the villa for endless fun in water! You can always head to the beach as there is direct access and numerous water activities such as ocean kayaks, sailing, snorkelling and marine experience etc. The villa and the apartment have their own living areas that are connected to the terrace from where you can take in the views. The main living room is well-furnished with comfortable sofas and features a traditional ceiling. With wooden interiors and columns running across the living room, the space is island-inspired and also reminiscent of Thai architecture. There is a Buddha statue, artificial indoor plants for décor, and other to brighten up the space. The villa as well as the apartment have fully-equipped kitchens that can be used for your culinary purposes as they have all modern amenities and appliances for your convenience. If you wish, you can dine on the terrace or enjoy the extensive menu of several restaurants at the Intercontinental! The villa and apartment are well-equipped to serve your needs even with modern comforts such as high-speed internet and DVD players. There is a washing machine for laundry needs and the daily housekeeping is included. You are also allowed to use the many excellent facilities and services offered by the estate such us the spa and sauna, table tennis, mountain bikes, and tennis courts to name a few! Surrounded by waterfalls and beaches, this beautiful location on Talim Ngam bay is perfect for a laidback tropical getaway with friends and family. Visit the famous Grandfather and Grandmother stones, Fisherman’s Village which is a little further away in Bophut, or the Mummified Monk another famous landmark.